Here you will find the scholarship application. Some of the scholarship questions will be a little different this year, so be sure to read and write carefully, and then return the completed application promptly. The completed application must be in the church office BY Monday, April 1st, 2019 at 4pm. If you are mailing your application please allow plenty of time for the post office to make delivery. Applications may be emailed to Pam@central-lutheran.org. When your application materials arrive at the church, they will be assigned a Student Application Number. The scholarship committee will meet during April to review the applications and recommend the recipients of the scholarship for 2019. The recipients will be contacted by mail shortly after the committee’s work is done. 1. Additional applications will be available from the CLC office. They can also be downloaded online at www.central-lutheran.org in MS Word, or as a pdf. To request an application by mail, send a self-addressed stamped envelope along with a note or short letter requesting a paper application to CLC, 28 E Columbia Street, Chippewa Falls, WI 54729, attn: Scholarship application request. 2. All applications must be typed on computer or typewriter. Handwritten applications will not be read. 3. All applications are due April 1st, 2019 by 4 pm. Applications will not be accepted after the office closes at 4:00 pm on Monday, April 1st, 2019! 4. All applications will not be accepted from anyone over the age of 22 years, unless the applicant is enrolled in a seminary, in which case the maximum age is 26. 5. Employment during high school for the purpose of saving and paying for post-high school education is expected of all applicants. 6. “B” students will receive 20 extra points of consideration (of 100 total on the application), and “C” students will receive 10 extra points (of 100 total) of consideration. “A” students will receive 0 extra points. 7. Regular worship attendance and participation in the ministry of the congregation is expected of ALL high school, college, or technical school applicants. Out-of-town college and tech-school students are encouraged to meet this requirement by worshiping and participating in a congregation or campus ministry center at their school. 9. 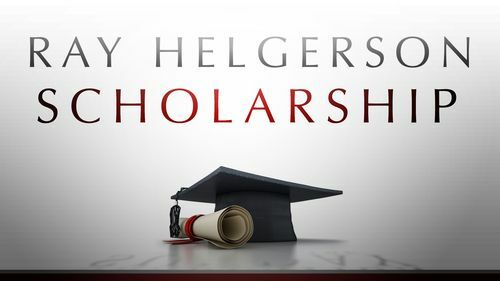 Active military personnel, and veterans who are eligible for educational funding from the U.S. government as a result of their military service are not eligible to apply for or receive this scholarship. 10. Scholarship will be announced and awarded at the Senior Recognition Sunday worship celebration in May at 8:30 am. Winners are expected to be at worship that day to receive their certificates and have a photo taken with Ray Helgerson. 11. Each scholarship will be at least $500, depending on the interest earned in the Scholarship Fund. The number of scholarships awarded also depends on the interest earned this past year. Checks will be made out to the winners, and mailed after successful completion of first semester. The Scholarship Committee (one Foundation board member, and two designees) hopes this information answers the questions you may have about the application process, and scholarship eligibility. Feel free to call me with any questions you may have.